This site features an overview of the Midcontinent Rift system of North America, an area that extends for more than 2000 km northeasterly from Kansas, through the Lake Superior region, and then southeasterly through lower Michigan. 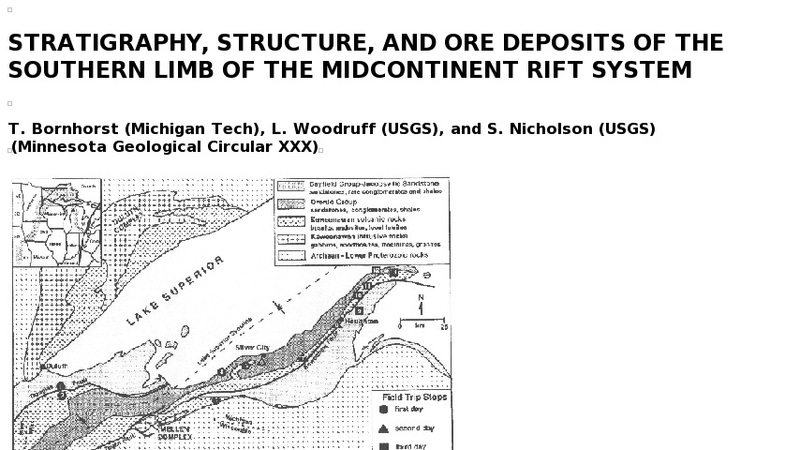 This summary of the stratigraphy, structure, and mineralization of rift rocks provides an overview of the geologic history in northern Wisconsin and upper Michigan. Separate sections describe the tectonic history and structural features of the area, the stratigraphy of volcanic and sedimentary deposits, and the mineralization that produced rich copper and silver deposits. Information is supported by numerous citations while maps and diagrams help illustrate the concepts.